It’s 6am. A frankly unbelievable hour. Nevertheless, I’ve caught the earliest bus I can tolerate, all in the hopes I’ll be able to pick up an iPhone X from one of the three Apple stores in the greater Brisbane region. I’ve chosen Chermside as my go-to — hopefully it’s a little less busy because it’s a little more out of the way, even though the Brisbane CBD store is easier to get to. It’s not that I forgot to pre-order the iPhone X, it’s just that I wasn’t sure I wanted one. I wasn’t sure then, and I’m still not sure I want one now. But I might as well try. By the time I arrive at Chermside, the queue is maybe 40-something deep. The Westfield is eerily quiet at this time of the morning, but it’s nice. Peaceful, even. I end up lining up for the iPhone X. It’s the second time I’ve ever lined up for any iPhone. I put in a reservation with the Apple blue shirts when they start working their way through the queue at around 7am, who congratulate me on my new iPhone once we’re finished choosing. The store opens at 8am, but it’s still about another hour after that I get to purchase my iPhone X. Was it worth it? Absolutely. You probably saw where this was going when I started writing about my iPhone 6 and 7 home screens, years after those devices were released. I thought we needed some kind of catch-up before getting to today’s iPhone X home screen. Given that it’s only been a year since the iPhone 7 was released, not much on my home screen has changed. I’m still using a home screen organisation method that’s similar to the CGP Grey method, and only a few apps have been swapped out. Notesy has been switched out for Editorial, as the former has been removed from the App Store. They’re both pretty similar apps, even if Editorial has a bunch of powerful workflow-type actions that I’ll probably never use. Slack was relegated to a folder after I discovered I wasn’t using it as much as I wanted to be, and Soulver makes a return to the home screen in its place. 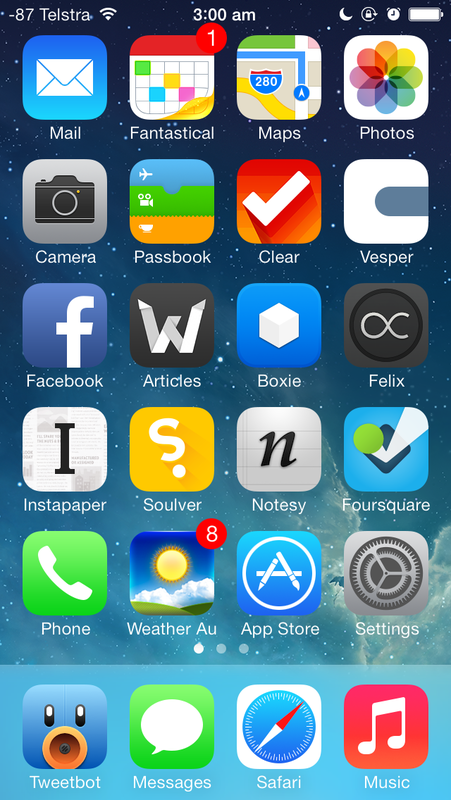 Vesper was also removed from the App Store and my home screen. I’ve got Yammer in its place, because I’m now a corporate drone and a slave to the man. WhatsApp was moved to a folder because I hardly use that either, and the Discourse app lets me check AppleTalk without having to load up Safari, even if it is just a glorified web wrapper. Ecoute was moved into a folder because it’s hard to beat the inbuilt Music app when I’m an Apple Music subscriber. To be fair, Ecoute still works with iCloud Music Library, but the built-in Music app has Apple Music integrations that aren’t available on third party apps. I’m also using a manual playlist for the “play all music from playlists within a folder” problem that I described as one of my main reasons for using something other than Music originally. Tootdon is on my home screen at the moment because I’m trying out Mastodon as an alternative to Twitter. Mastodon feels a lot like App.Net right now, but we’ll see how it all pans out. It’s been two weeks since the release of the iPhone X, and so far, Gmail, Google Maps, Clear, Editorial, Soulver, and Discourse don’t support the larger iPhone X screen. I’m kind of surprised Google’s apps aren’t updated, I can understand why Clear hasn’t (they’re apparently working on a complete overhaul, but the app was very custom to begin with), but apps like Editorial, Soulver, and Discourse are a little behind. Discourse is particularly puzzling, given that it looks like just a super-barebones web wrapper that you wouldn’t think has much custom code. But there’s another problem with the iPhone X that’s just as important as non-optimised apps: it’s almost impossible to find great wallpapers for it. Even if you do manage to find something with the right resolution and the right aspect ratio, the quality of the screen means you’ll quickly notice any imperfections. Thankfully, a few recent Samsung devices (the S8, S8+, Note 8, and slightly older Note 4) all have displays with similar aspect ratios. If you can tolerate a slightly zoomed wallpaper, then there’s a whole range of 2560×1440 wallpapers that you can find. I’ve also been using Vellum. For the first time since the iPhone 4 was released, the iPhone 7 introduced no changes to screen size over the previous model (notwithstanding S-revisions). 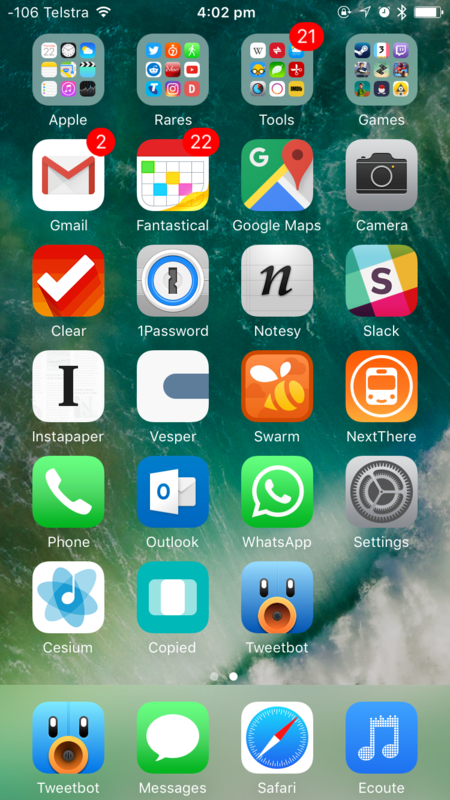 But sometime during the two years of the iPhone 6 and the iPhone 7, I switched to some variation of the CGP Grey method of home screen organisation, once again covered by Ben Brooks. 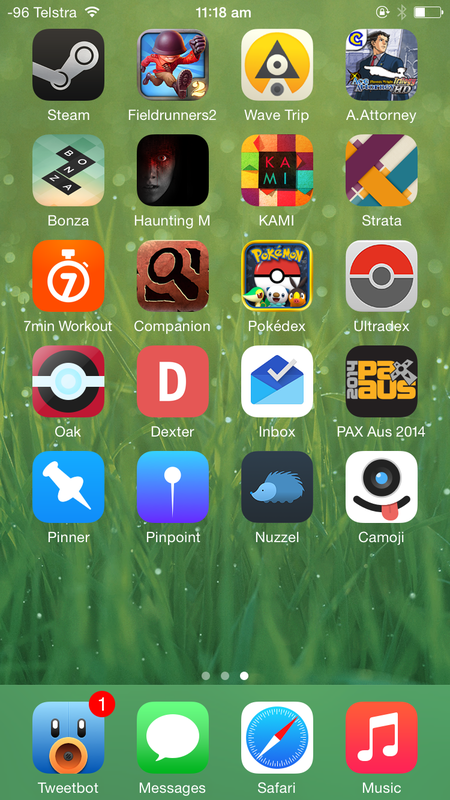 There’s now just one page of apps, at least one row that has no apps at all, and four icons in the dock. Everything else goes in one of the folders. 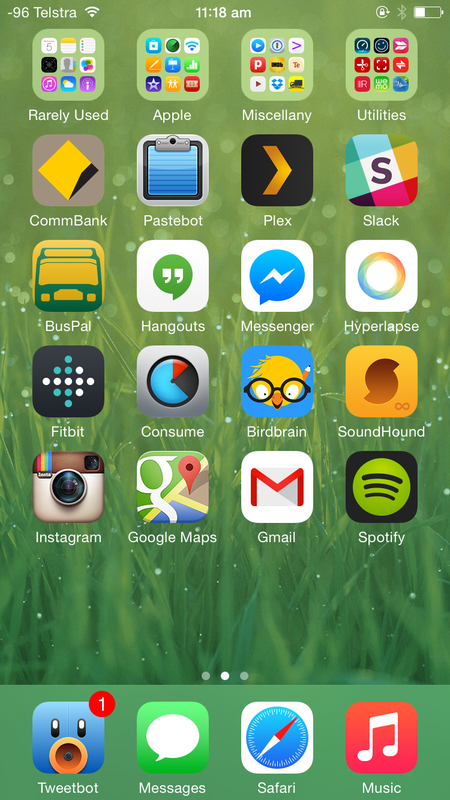 The advantages of this method of home screen organisation make a lot of sense. The days of having pages and pages of apps were over since Apple introduced folders, and this takes that idea to the next level. No longer do you have to rely on muscle memory to remember which apps are where, and instead, you can rely on Spotlight to find the app you’re looking for. Letting go of any inclination to organise those top-row folders is also incredibly freeing. Your most-used apps can still remain on your home screen, and with iOS 9 and the introduction of Spotlight suggestions, sometimes you don’t even have to search for the app you want, as it appears in your Spotlight app suggestions. If you’re thinking of adopting this method, I’d highly recommending hit “show more” within Spotlight to show eight app suggestions instead of the default four. Unfortunately, this requirement for some folders and just one page of apps meant that I had to make some decisions about how many individual apps I had on my home screen. Thankfully, changes to usage patterns made that a little easier. This is going to get a little lengthy, but stick with me. Let’s talk about what was removed, to start off with. If I was going to keep one of the Camera or Photos apps around, it was going to be Camera, as I could always access Photos from within Camera. The argument could also be made for removing Cameras, as you have shortcuts to it from the lock screen and Control Center, but I still wanted it on my home screen too. With a folder dedicated to games, off went Threes. Passbook, Facebook, and Wikipedia also went — not that I don’t find those apps useful, but I found I wasn’t using them enough to justify a now-scarce spot on my home screen. Once I realised I hardly used the App Store app for finding new apps or basically anything at all, that was also moved into a folder. Pocket Weather Australia was moved into a folder, which initially proved to be a bit of a dilemma thanks to the fact that the CGP Grey method doesn’t work well with folder badges. Folders only have one badge that is the sum of all the badges on apps within it, and because I use Pocket Weather’s badge to tell me about the current “feels like” temperature, I had to turn off notification badges for every other app in the same folder. As it turns out, none of the apps in there have badges I care about anyway, so off went that switch. Boxie fell victim to “internal team issues”, which meant that development ceased and the app was removed from the App Store and my home screen not too long after. 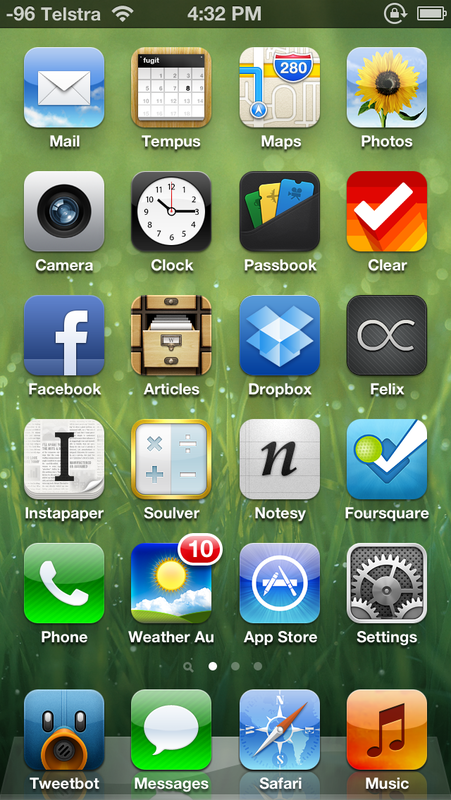 Exactly seven apps remain unchanged from my previous iPhone. Fantastical, Clear, Notesy, Instapaper, Vesper, Swarm, and Tweetbot remain the staples of my third-party iOS experience, all representing the best-in-class versions of their respective App Store categories. Tweetbot 4 had only recently been released, which is why I was running it in tandem with the old version until I had a chance to do something about my numerous written, but not tweeted, drafts. It was during the period between iPhones that I started a new job in a new city, which meant a work email account. Not wanting to cross the streams, I decided to ditch Mail in favour of Gmail for my personal email. This turned out to be a pretty good choice, as I gained push email and smarter notifications at the cost of not using the built-in mail client. Living in a new city also meant I needed the most accurate data possible for Maps, which meant swapping out Apple’s aesthetically-pleasing maps app in favour of Google’s more accurate one. The jury’s still out on which one I prefer. Sick of Apple’s unending changes to the Music app which removed features I used, I was trialling Ecoute and Cesium as potential replacements for the default Music app. At the time this screenshot was taken, I had settled on Ecoute as I liked how it created a playlist from a folder of playlists containing all the songs within the folder. 1Password — I think I added this because I wanted to focus more on using strong, unique passwords for online accounts. Owning multiple computers meant I was logging into those accounts multiple times, and because I haven’t ponied up for 1Password on multiple platforms, the iOS version is the next best thing as my iPhone is always with me. Which is a good thing, as the 1Password iOS app is great. Slack — I’m not sure why this app is on my home screen. I’m a member of exactly one workspace, which hasn’t had a message in any of its channels in months. I could easily swap this out with something else, but for now, I enjoy the nerd cred that I get from having it there (even if I’m the only one that knows about it). NextThere — A new city meant new, real-time public transport options, and that meant NextThere. No other public transport app comes close to the everyday convenience offered by NextThere when it comes to knowing the next train or bus departing from your closest station or bus stop. And besides, who doesn’t want a smiling bus on the their home screen? Outlook — This is for work email only, although I’d prefer using it for Exchange and Office 365 email over the built-in Mail app. Something about a first-party app just makes me feel more comfortable about the reliability of the thing, you know? WhatsApp — My permanent WhatsApp status says “I begrudgingly use WhatsApp. Please don’t message me here unless you really have to.” I really have no idea why this was on my home screen at the time of this screenshot. Copied — With the demise of the iOS version of Pastebot and no replacement on the horizon, I wanted something capable of doing some iOS clipboard management. The need is largely negated now that iOS and macOS talk to each other and I can copy stuff between both operating systems, but having an on-device clipboard manager has still come in handy on occasions, especially when I’m trying to copy and paste between my iPhone and iPad. The folders themselves are self-explanatory. I could delete most of the Apple apps now that that’s a thing you can do as of iOS 10, but I keep them around. There’s a bunch of apps in the Tools folder that I rarely touch, and even more apps within Rares that I use maybe a handful of times per year. Games tends to get a few new additions here and there, but for the most part that stays pretty static too. The eagle-eyed among you will note that I’m not sticking completely to the CGP Grey method of home screen app organisation, because there’s three apps in the row that’s supposed to kept free. I’ve been using that row as a trialling ground of sorts — some apps stay there temporarily to encourage use while I give them a red hot go, and from there they’ll either get promoted to a folder, or if they’re particularly good, a coveted spot on the home screen. And if they’re not that good, then it’s the little X for them. The last time I did one of these was back in 2013 not too long after the iPhone 5 was released, so we’re definitely long overdue for an update on my home screen. I think it’s interesting how this kind of thing changes over time, either because apps stop getting updated, better alternatives come along, or my own usage patterns change. Either way, let’s get into the nitty gritty. 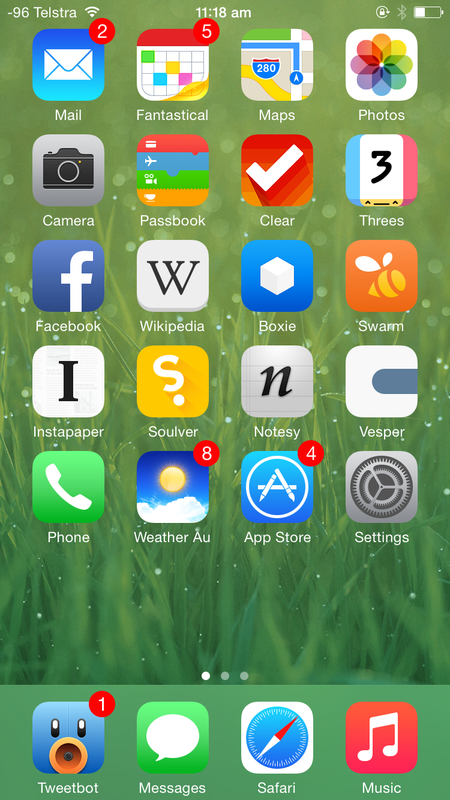 I don’t have a definitive screenshot of my very first iPhone 6 Home screen, but I think is the closest thing, and it’s certainly the only home screen screenshot from just after the iPhone 6 release back in September 2014. As you can see, not that much has changed from the iPhone 5 home screen: besides adding another row of apps, introducing a whole new dilemma for home screen icon organisation, I’m more or less using the same apps. Old favourites Fantastical, Clear, Facebook, Boxie, Instapaper, Soulver, Notesy, Vesper, and Pocket Weather Australia all make a return, and Tweetbot retains its coveted number-one spot on the dock. This being a year after the introduction of iOS 7, most apps and their icons have made the jump to feature the divisive flat design. Changes to apps between my iPhone 5 and iPhone 6 include swapping out the much-loved, but unfortunately no longer updated Articles for the surprisingly great official Wikipedia app, which has all the features I care about in a mobile Wikipedia interface. Following the developer joining Apple, Articles isn’t the first app that was abandoned, and it certainly won’t be the last to be swapped out for a more modern alternative. The demise of App Dot Net also saw the removal of Felix from my home screen. A pity and a damn shame it’s no longer available in any shape or form, as I’d rate Felix in my top five iPhone apps of all time based on aesthetics and usability alone despite the fact it was tied to a promising, if ultimately doomed, social network. Sometime in 2014, Foursquare decided to split its app into two. Foursquare became the app for place recommendations, while Swarm was the gamified version, the one you used to check into places and collect mayorships based on how many times you had been there recently. Because the mayorships and check-ins was the original reason I joined Foursquare, I decided to keep Swarm on my home screen. Foursquare was relegated to a folder. Threes is the only game to feature on my home screen, but mostly because it’s perfect for the in-between moments that life sometimes gives you. Note that I’m still using multiple pages of home screens, with single icons on the first home screen, some folders on the second, and mostly games on the third. I have this weird thing where I’ll keep a tab open for days, weeks, even months, if there’s something even potentially interesting that I can’t deal with right now, but want to do something with eventually. Before you ask, yes, I have heard of bookmarks, but ask any nerd and they’ll tell you they do a similar thing with their browser tabs. It’s not uncommon to have umpteen tabs open at any one time — and of all the stuff I have backed up, I’d be pretty devastated if I lost all my tabs. I could potentially get them back, but that involves trawling through days, maybe even weeks of internet history. When you visit as many websites as I do, it’s hard to tell what you had open as a tab and what you were merely browsing out of curiosity. But I digress. I’ve had two tabs open for close to a year now, and as much as I’ve wanted to write something substantial about the iPad mini, there just isn’t anything worth writing about. Not because the iPad mini is boring or anything, but because I just haven’t been inspired to write anything worth publishing. Because when it comes down to it, the iPad just isn’t as interesting as the HP TouchPad was, back in the day. WebOS was just so bad and so good at the same time, you know? 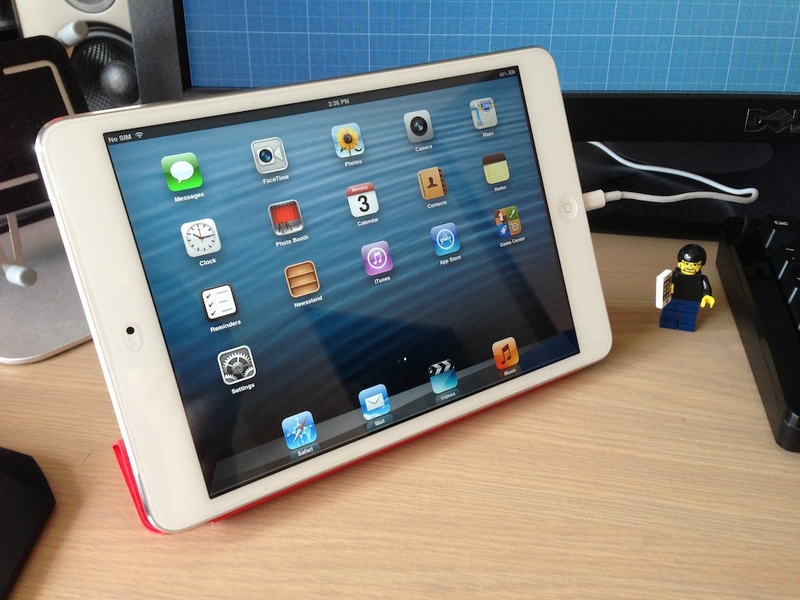 I’ve owned an iPad mini since it was first released around this time last year. It wasn’t my first tablet, but it is my first iPad. I honestly don’t have anything else to say about it that hasn’t been said elsewhere, but with the new iPad Air coming out riding on the coat tails of the iPad mini, I thought I’d take a moment to write about how I’ve been using it. I think the most telling thing about the iPad is that it hasn’t replaced my computer. That’s telling because I see a lot of older, mature folk replace their clunky Dells with futuristic, touch-enabled iPads, even if they don’t run the same programs as their old computer used to. Why? I’m not sure, exactly, but at a guess, it has something to do with how intuitive Apple has made iOS (and then turned everything upside down with iOS 7, but that’s for another time). But as much as I enjoy using the iPad, it hasn’t replaced my computer. If all I’m doing is light web browsing and catching up on my Instapaper backlog, then sure, I’ll pick up the iPad over the MacBook Pro any day; the iPad is lighter, has a much longer battery life, and lets me concentrate on one thing at a time, for the most part. It’s kind of like the Kindle, in that regard. For everything else, there’s the Mac: for switching between any of my umpteen open tabs, writing content into browser text boxes, and doing any other kind of serious work. I tried writing one of the MacTalk daily news posts on my iPad mini one time, and while it was OK, the software keyboard really hindered the process by needing to switch between the various keyboards to access special characters. I could have worked around the issue by using a hardware keyboard or using an app that offered an extra row of characters, but that would have required a little extra preparation on my part, something I wasn’t able to do at the time. It’s been a year since the last time I wrote one of these, so I figured it was about time I updated the previous post with everything that’s changed during that time. IOS 7 brought a massive list of changes, first and foremost of which was a massive overhaul of how everything looks and feels. Some people absolutely hate it, but I like it, for the most part — it makes everything fun. Anyway, let’s talk about some apps. It’s been a while since I last wrote one of these things, and after reading about how good the Windows Phone 8 home screen is (and the story of how it came to be), I realised even though this kinda thing only interests a handful of people, it’s still interesting to me. My previous iPhone homescreens were organised according to what I’m calling a “loose Ben Brooks configuration”, that is, one based loosely upon the methodology upon which Ben Brooks organises his homescreen. The iPhone 5 introduces a new dilemma in this regard, which Ben has also covered, but I’ve come up with my own spin on things. Instead of not using the very top row (which Apple’s new human interface guides says not to bother about, UI wise), I’ve simply added an extra row somewhere in the middle. Why? Because it’s really not that much of an issue being able to reach the entirety of the iPhone 5 display — even when using it one handed — like Apple’s “Thumb” ad shows. Tempus now occupies the position previously occupied by Calvetica. It’s a calendar replacement by the same developers, but somewhere along the way, I fell out of love with Calvetica. While it was still a great calendar replacement, it wasn’t the same app it originally was, something even the developers themselves admitted. Tempus is the minimalist calendar replacement I’ve wanted — but it has to be noted this is the only app on my homescreen that doesn’t support the taller iPhone 5 display. The developers say it’s coming “in the future“. Also notable is the Apple Maps app, instead of the great Maps+ replacement. I want to like Apple’s maps in iOS 6 because they’re superior in a number of ways (vectorised maps, much lower data usage, heaps of caching), and this is my way of doing so. For the record, Maps+ is just a small swipe-towards-the-left away, if and when I run into any issues. Passbook is here because I’m a big fan of the concept — if only more retailers would jump on board, it would likely be on your own homescreen, too. Clear is here because it’s my go-to for doing short lists, fast. The completely gestural interface is insanely brilliant, and I enjoy it a lot — it’s a great app for making short lists very quickly. I don’t use it for actual reminders (because I’ve got Reminders for that), but it is useful for short lists: to-dos, shopping lists, games I want to buy, and so on. Facebook was one of the apps “promoted” from the second homescreen to the first, thanks to the four extra apps I can have on the first homescreen. I don’t use it as much as, say, Tweetbot, but it’s still there when I need it to be. Articles for reformatted Wikipedia articles, and Dropbox for accessing my Dropbox documents when I’m out and about. Felix is one of the better App.net clients out there — you know, that semi-exclusive social network that popped up recently. By nerds, for nerds. Netbot could just as easily be occupying this position, but Felix has Helvetica Neue on its side. Instapaper continues to be the best way to read later and Soulver remains the best calculator. Notsey takes over from Elements as my Markdown-enabled, Dropbox-syncing plain text editor of choice — it doesn’t use Museo Sans like Elements does, but I was sick of the error messages Elements would frequently pop up. Notesy is perhaps a touch more customistable than Elements is, but otherwise, they’re pretty much the same app. Foursquare was also one of the promoted apps from the second homescreen. Pocket Weather Australia (a.k.a. Weather Au) is the best weather app for Australians, period. After languishing in a folder in the second page for too long, it now gains a spot on the homescreen — with the “feels like” temperature for my current location as the icon badge constantly updated. It’s an insanely beautiful app that’s also available on Android, if you’re so inclined. Tweetbot is among the few apps that mean I won’t be leaving the iOS platform any time soon. I’ve never seen an Android app that even comes close to the quality of Tweetbot, and it’s unique in that it’s perhaps one of the only apps that actually deserves a place on the dock. It’s amazingly good. Oh, and I occasionally use it for Twitter, too. I still mourn the loss of the iPod app. I’m actually using one of the default background wallpapers. Apple has done an amazing job picking out the default wallpapers that come with iOS 6 — a few are flashy, yes, but the rest are beautifully subtle, two-tone affairs suitable for use on both the lockscreen and the homescreen. If you want to enable the numeric signal strength without jailbreaking, follow these instructions. A few weeks before the iPhone 5 was even announced, before all the rumours, part leaks, before all of that, I wondered what I was going to do with my old iPhone 4. 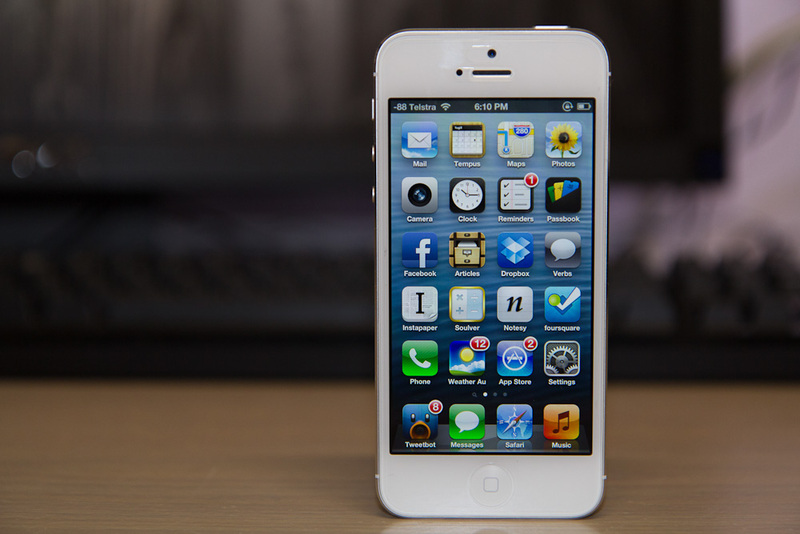 See, I’m on the “good” iPhone cycle: my first iPhone was the 3G, then the 4, and now, the 5. I skipped the first iPhone due to it not being available in Australia, skipped the 3GS due to still being on a contract, and skipped the 4S for the same reason. For many, this two-year contract cycle is nothing new, the natural progression of things if you’re not a compulsive upgrader, and/or don’t have the funds to buy a new iPhone every year. In any case, as I pondered what I was going to do with my old iPhone, it dawned on me: why not sell it off and use another phone I had lying around? As I dwelled on this, it began to make more and more sense; by selling the two-year-old iPhone 4 off, I’d get a few dollars more than I would have if I sold it off after the release of the iPhone 5. Question my committal if you want, but as a test, I pulled out my trusty old Nexus S to see how I’d fare using Android for a few weeks. Jelly Bean had just just been released, you see, and now was as good a time as any to test the latest and greatest Android release, on hardware around the same age as my iPhone 4. This was my first mistake. It’s not that I hate Android. Really, it’s not. It’s just that, for me personally, Android doesn’t quite gel as much as iOS does. Things are less fluid. Third party app quality just isn’t there. But like any curious and “bored with iOS” technology enthusiast, I forged on. This was my second mistake. For two weeks, it was nothing but constant grating. Me constantly fighting the OS on what I wanted to do versus what it allowed me to do. I’d imagine my experiences with Android during the few weeks of pain would have been an approximation of an abusive relationship of some kind. Sure, it was stable enough. I only saw a few crashes here and there, mostly from apps labelled as beta in the Play Store. Sure, there were apps available for all the popular things I used on iOS: Twitter, Instagram, Instapaper, and even a Dropbox-syncing, Markdown-supporting, plain text editor. But the thing is, it’s been a year since I last looked at Android, and I found myself going back to the same apps I used last time around, simply because no better alternatives exist. Actually, that’s not entirely true: there’s now and official Instapaper client for Android. Other than that, the Android app landscape is blacker than black. Where are all the good quality apps? Suffice to say, my Android experience, Jelly Bean and all, was pretty bad. Two weeks later (I had originally planned to stick it out for at least a couple of months, until the iPhone 5 was out), I was crawling back to my iPhone 4 and begging it to take me back. In some ways, Android reminds me of the desktop Linux experience. It has its advantages, but probably won’t ever reach mass popularity with non-technology-minded people due to inherent issues with the ecosystem and how things work. Unless its locked down and given a stern talking-to, developers won’t be attracted to it anytime soon. And that means it will stagnate. But enough about Android and mediocre software experiences combined with stellar hardware specs packaged in the cheapest plastic you’ve ever felt. I’ve since sold off my Nexus S and have acquired the iPhone 5. Thinner. Lighter. Faster. 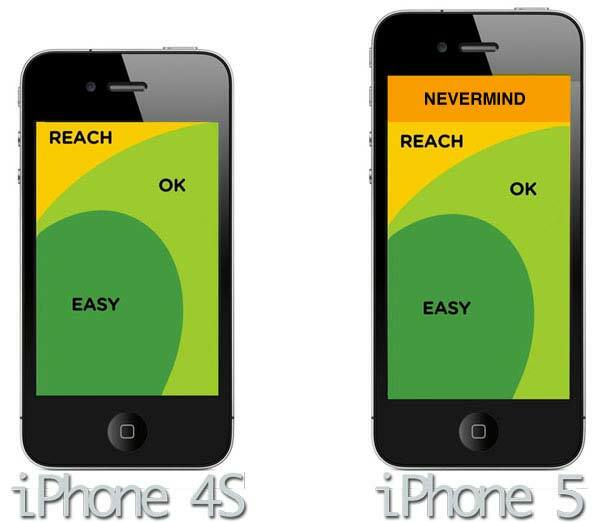 All these verbs are true of the iPhone 5, but I still want to talk about three main aspects which make it all worth it. On the face of it, Spotify is brilliant. Who doesn’t want a music collection the size of the iTunes Music Store for free? All the big names are on-board: Universal Music Group, EMI, Sony, Warner, and so on. Spotify means that anytime you want to listen to a track — be it something that you’ve just Shazam’d or something you heard on the radio a few days ago, you can open up Spotify, search for your track or artist of choice, and listen to their music, completely free of charge. When I first started out, I wasn’t so sure about Spotify, either as an iTunes replacement or as a standalone music ecosystem. I had my doubts about how Spotify could work for me, especially with such a heavy emphasis on the social and music discovery (and it’s not just because I have what some would call an extremely varied music taste, either). The fact that Spotify prioritises the social aspects of music over some of the intelligence of iTunes should give you some idea as to whether Spotify will work for you. Maybe the world doesn’t need to know you love listening Carly Rae Jepsen as much as you do, (which is exactly why there’s a Private Session feature). You can share tracks, artists, albums, or playlists to pretty much anywhere you can think of. There are still things that irk me a bit about the service, such as the fact the range of metadata is paltry, no, basically non-existent, in comparison to iTunes. You don’t get play counts in Spotify, Last Played info, number of skips, or any of that kind of information. It’s basically just track name, artist, time, and album. That’s it. But you know what? Not having all of that metadata is strangely liberating, too. It means I don’t have to worry about meticulously keeping my library organised, or worry about album art, because Spotify does all of that for me. I get that Spotify isn’t for everyone — if you’re into very specific music genres or particularly obscure stuff (you hipster, you), maybe Spotify isn’t exactly what you’re looking for in a streaming music service. But hey, that’s what the 30-day trial is for, right? At the end of the day, I’m not sure whether I’ll continue with Spotify or not after my trial is up. It’s a great service, and there’s a lot to love. Being able to look up and play almost every artist I can think of is extremely, extremely cool; it innately satisfies the desire for instant gratification everyone seems to have these days, and perhaps for that reason alone, means that Spotify will be hugely successful. On the other hand, I miss my metadata and my smart playlists terribly. Having none of that info in Spotify is a pretty big blow to how I’ve been listening to music in the past. Earlier this week, I cancelled my Spotify subscription. As it turns out, I did miss that kind of metadata more than I might have originally let on. The thing is, I rely on play counts to tell me how much I “like” certain music. Last played information, combined with play counts, tells me how long it’s been since I’ve listened to heavily-played tracks in my library, like Call Me Maybe. I’m convinced that Smart Playlists are the best thing since sliced bread, and losing them in Spotify was too much of a compromise, seemingly for the advantage of music availability and discoverability. Which is kind of a shame, because there’s lots to love about Spotify Premium. Having the biggest music library accessible wherever you have a data connection is nothing short of amazing, and it comes in ridiculously handy forms: a few friends wanted to listen to a song, and instead of looking it up on YouTube, I simply opened up Spotify, put in the artist name, and there it was — because if nothing else, isn’t technology supposed to make this kind of stuff more accessible to people? Isn’t technology like Spotify meant to lead to greater enjoyment of the things you love the most, i.e. music? I liked how Spotify because it scrobbled to Last.fm on mobile. I liked how having Spotify on my phone meant I didn’t have to carry around all the music I wanted to listen to. I liked (in part) how Spotify was all about the social — sharing music to others, listening and subscribing to playlists others had made, and even all the discovery features to help you to discover new music. In the end though, paying $12 a month for those privileges didn’t seem worth it to me, especially as I started listening to my own music within Spotify towards the end of my subscription. I mean, doesn’t that kind of defeat the purpose of having the largest music library, literally at your fingertips? Thankfully, there’s good news. The difference between Spotify and Rdio is that Spotify has a free tier, too: for exactly nothing, you can use Spotify as a preview of whether you’ll like a new album by an artist, or if you’re just looking to play a song that you don’t own and don’t want to go track down. You don’t get access to the mobile version of Spotify on the free version nor any of the ofline features, but that’s not a big deal when you’re listening to local files you own, anyway. Plus, I don’t mind syncing music to my device even though it takes up precious megabytes. All this means that Spotify on the desktop still manages to satisfy that “instant gratification” drive I have when it comes to music — I can still listen to any song I want to, just with a short ad interspersed between tracks. In fact, just the other day I opened Spotify to listen to a Pink song I had heard before but didn’t own — after playing that a few times in Spotify, I acquired a copy and now it sits on some 68 plays in my iTunes library. If you haven’t given Spotify a go yet, you should. It’s a good service with many neat features — it’s just that for the way I personally listen to music (i.e. going for the overplay with one, two, or a whole album at a time and swapping between artists and albums I love), Spotify and Me just weren’t meant to be. And I think I’m okay with that. Apple created and introduced what we now understand to be — and experience as — the modern smartphone. via Kind of a Hater • Portrait of the Google as a great artist. To those who want to use Android, I say go for it. I don’t think that choice is wrong — there are many fine things about the Android OS and many things it does differently and better than iOS. I can understand how tech-savvy power-users who know what they are getting into would like Android. For them, the trade-offs in certain areas are a welcome sacrifice in exchange for the customizability, the different look, and the plethora of hardware devices to choose from. via A Long-Time Apple Nerd’s Review of the Galaxy Nexus and First Experience With Android — Shawn Blanc. And that, ladies and gentlemen, is Android summed up. It’s not that I wouldn’t recommend an Android phone to your mum or dad, it’s just that I wouldn’t recommend an Android phone to your mum or dad. For those that actually like the appeal of Android, by all means, you’re more than welcome to. Hell, even I like certain aspects about Android, but that doesn’t make it the comparative “best”. Qualifiers such as “are they buying based solely on price?” aren’t even all that relevant to buying an Android phone, as a second-hand 3GS or similar might be more suitable instead. I’d think long and hard before recommending an Android phone to anyone. One other thing: I’m super glad I don’t work in a telco store that sells Android alongside the iPhone, because I doubt I’d be able to “sell” Android phones based on one feature alone. I mean, Google integration, absolutely. But iOS has that in iCloud. 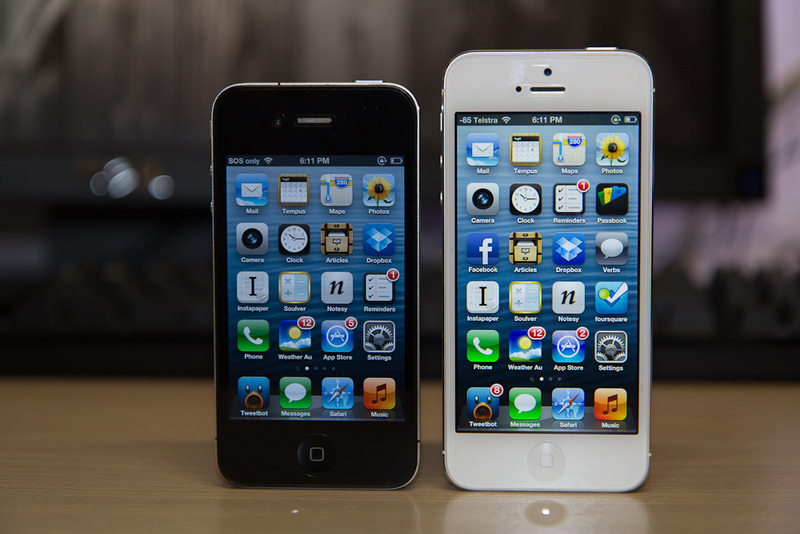 IOS is comparatively easier to sell; do your friends have iPhones? Boom, free messages between you and them. That feature alone could sell a customer, never mind an app for anything you could poke a stick at.